File photo by Stephanie Rivera. While most of us enjoy the extra day off this Memorial Day weekend, here are some events going on in Long Beach to help you reflect on its meaning and remember those who died while serving in the country’s armed forces. 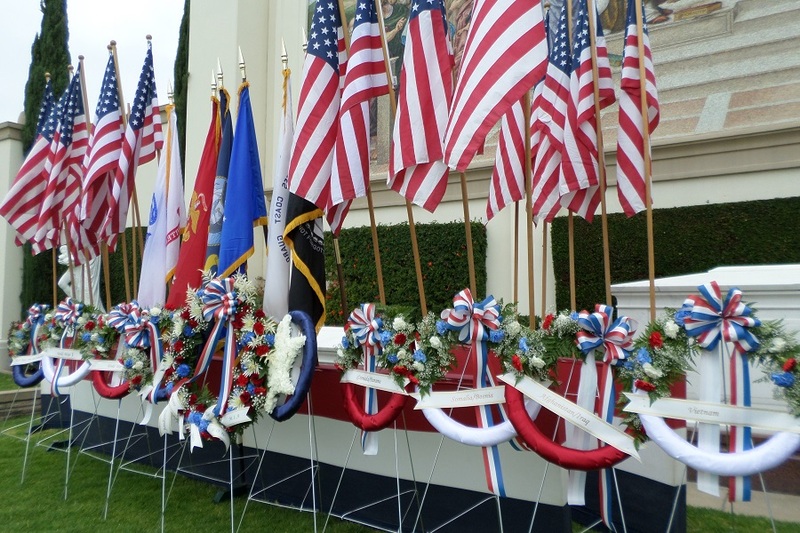 Remember the fallen at Forest Lawn in North Long Beach on Monday as part of the cemetery’s annual Memorial Day event. The program starts at 10:00AM and will include a keynote address, presidential proclamation, rifle salute, color guard, wreath laying and free souvenirs. The event is free and takes place at 1500 East San Antonio Drive. Click here for details. On Memorial Day, the Queen Mary will be offering free admission to active service members of the armed forces, retired military personnel and veterans. Also, don’t miss a patriotic airshow honoring WWII servicemen on Thursday! The Queen Mary is located at 1126 Queens Highway. Fore more information click here. Farmers & Merchants Bank and Long Beach Navy Memorial Heritage Association will join the Historical Society of Long Beach in presenting a Memorial Weekend program, “1942: The Turning Point in the Pacific,” on Saturday, May 27. Historian Timothy Friden, the lead researcher and curator of their current exhibit Long Beach Remembers Pearl Harbor, will be giving a presentation on the critical early months of the Pacific War with Japan and ultimately decided its outcome. The discussion will also trace the development of Long Beach as a West Coast base for the U.S. Navy and how some of the ships and officers that once called their city home went on to perform vital roles in the war in the Pacific. This event is free and starts at 1:00PM. 4260 Atlantic Avenue, Long Beach CA 90807. Click here for details. Long Beach City Hall will be closed on Monday, May 29. Street Sweeping and enforcement of street sweeping violations will not occur on May 29. Street sweeping will resume its regular schedule on Tuesday, May 30. Refuse and Recycling collection will occur, per the normal schedule, on Monday, May 29. All Long Beach Public Libraries (LBPL) will be closed on Saturday, May 27, in observance of the holiday. Bay Shore, Burnett, El Dorado and Michelle Obama Neighborhood Libraries will be open on Sunday, May 28, per their normal schedule and all libraries will be closed on Monday, per their normal schedule and will reopen on Tuesday, May 30.